Download "Curso EFA - Inglês. A. Ouça a Tzu-Lee e o Jack falar sobre as suas actividades depois da escola. Complete a tabela." 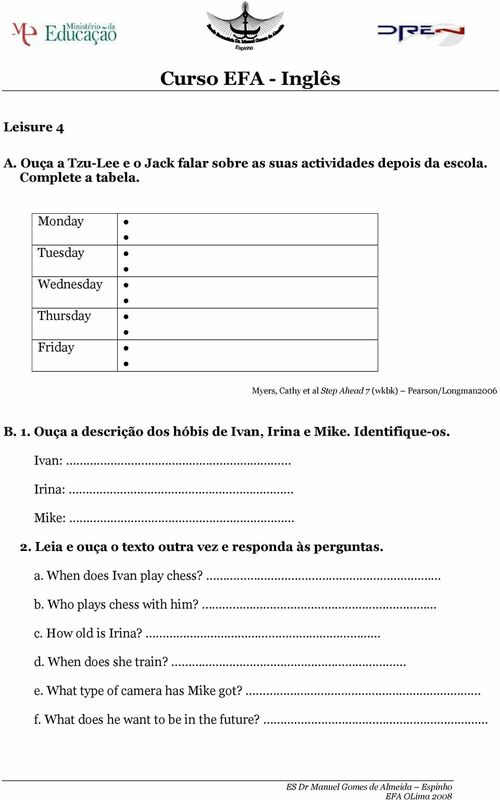 1 Curso EFA - Inglês Leisure 4 A. Ouça a Tzu-Lee e o Jack falar sobre as suas actividades depois da escola. Complete a tabela. Monday Tuesday Wednesday Thursday Friday Myers, Cathy et al Step Ahead 7 (wkbk) Pearson/Longman2006 B. 1. Ouça a descrição dos hóbis de Ivan, Irina e Mike. Identifique-os. Ivan: Irina: Mike: 2. Leia e ouça o texto outra vez e responda às perguntas. a. When does Ivan play chess? b. Who plays chess with him? c. How old is Irina? d. When does she train? e. What type of camera has Mike got? f. What does he want to be in the future? 2 3. Faça a correspondência das palavras à esquerda com as definições à direita. a player a champion an astronaut a professional a photographer does something to earn money travels in a spaceship plays a sport or game takes photographs wins competitions C. 1. Ouça o Adam e a Janey. Escreva ou nas actividades de que gostam ou não gostam. Athletics Skateboarding Relaxing Walking Football Table tennis Chess swimming Adam Janey 2. Escreva frases sobre o que eles gostam ou não gostam de fazer. 3 3. Ouça a Janey questionando o Adam sobre as suas actividades. Complete o diálogo. Janey: So how often do you do sport, Adam? Adam: J: Wow! How often do you go swimming? A: a week. J: And do you go running? A: a week, on Saturdays. J: And how often do you play football? A: a week. J: Do you sit down and relax? A: Never! D. 1. Ouça o Brad. O que faz ele depois da escola? - He sings in a band - He plays in an orchestra. - He presents a radio programme. 2. Ouça outra vez e ponha por ordem as seguintes perguntas: What music do you choose? Anything else? How often are the programmes? What exactly do you do? Do you have interviews? How many other students participate? 3. Ouça outra vez. Verdadeiro ou falso? The programme is once a week. He plays music he likes. He interviews parents. He writes the school news. A lot of students participate in the programme. 4 E. Leia os seguintes textos. People think that teenagers have a lot of free time but it s not true. We get a lot of homework. But this term I want to go to an after-school club and do drama or go riding. I think it s important to do different things, not just study, study, study all the time. Teenagers have a hard life. Tzu-Lee I don t have much free time. After school I help my dad. He s a mechanic. I like learning about cars. I haven t got any special hobbies but I like listening to music and making CDs for my friends. Jack We have lots of free time and there are many activities for pensioners in our town. On Mondays we play chess. On Tuesdays we go dancing. On Thursdays we go swimming. On Fridays we do gymnastics! We sometimes go on coach trips to different places or visit museums. We re never bored. It s not a bad life. I m a working mum so I don t have much free time. When I come home I cook the dinner, watch a bit of TV and go to bed. At the weekends I like spending time with my kids. We go bowling or cycling if the weather s nice. I like walking too but the children always say it s boring! Jack s mum Tzu-Lee s neighbours Myers, Cathy et al Step Ahead 7 Pearson/Longman Verdadeiro ou falso? Tzu-Lee thinks teenagers have a lot of free time. She thinks it s a good idea to study all the time. Tzu-Lee neighbours are not very active. They have a good life. Jack plays sports after school. Jack likes music. Jack s mum has a job. Jack s mum lieks doing activities with the family at the weekend. 1level ENGLISH. Novo Uno Fundamental 5 Inglês. Do You Eat...? You can speak English! That s great. In this part, we talk about food.